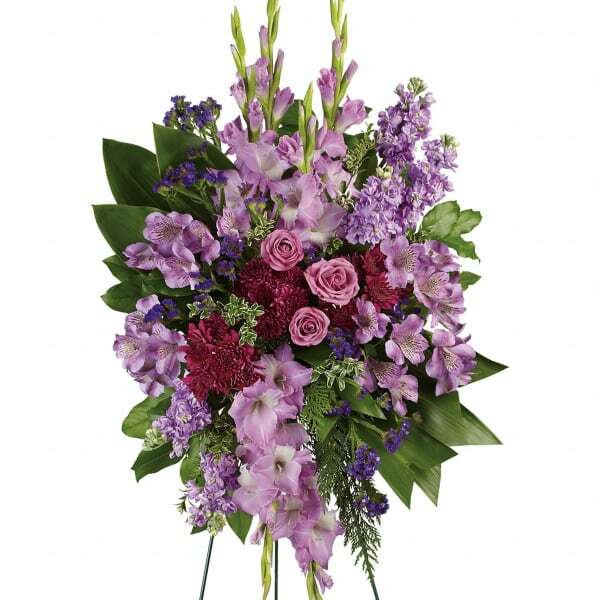 Take a walk through the garden of memories with this lush spray of lavender and purple blooms, accented with fresh green ti leaves. It's a joyful expression of sympathy sure to be appreciated. 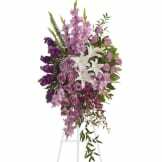 • This regal spray includes lavender roses, lavender alstroemeria, lavender gladioli, lavender stock, purple cushion spray chrysanthemums, purple sinuata statice, green ti leaves, flat cedar, oregonia and lemon leaf. 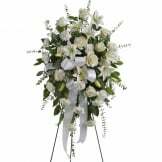 Measures approximately 29 1/2" W X 43 1/2 " H.
Flowers will be received by a McComb & Wagner Funeral Home and Crematory's staff. Ordered on Sunday afternoon the day before the service which was at noon on Monday. Was told delivery couldn't be guaranteed before 11AM but was assured it would arrive before the service. The spray was delivered a little before 11AM so was very happy with that and the fact they kept their word about delivery. It was very pretty. I was afraid it wouldn't look as nice as the the one in the photo but it did - maybe better. I was completely satisfied with it. Had not ordered from The Sympathy Store before but would to do it again. Our flowers were delivered on time and were exactly what I had ordered. The size, flowers all looked exactly like the picture I ordered from. We were very satisfied. Great prices too! Turned out beautiful, thank you very much! If the need comes again to order from you we will definitely order another arrangement. Thank you again! 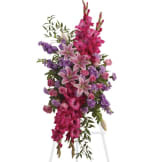 All of our flowers are designed and delivered by hand from a local florist in in Shelton.